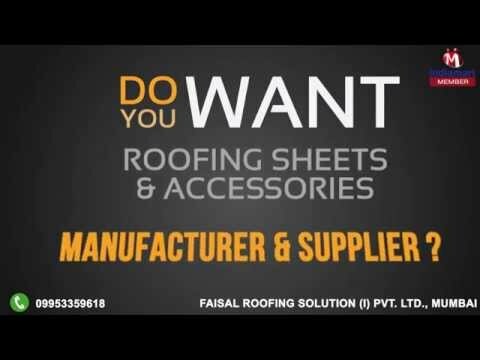 Welcome to Faisal Roofing Solution (I) Pvt. Ltd., established in the year 2011, we are the leading manufacturers, suppliers and traders of this highly commendable range of Roofing Sheets & Accessories. The offered range is widely praised for its superior sturdiness, durability resistance to corrosion and highly standardized quality. This is owed to the utilization of high grader raw materials and modern machines, in compliance with the set industry norms and guidelines. The offered range, comprising the finest Roofing Sheet, Roofing Accessories and Trapezoidal Sheet, is widely acclaimed and asked for and is quite reasonably priced. In addition to this the finest Window Replacement Services and Roofing Fabrication Services, are made available by us. In addition to this, our ethical working habits have helped us in generating a huge client base, comprising D. Mart (Mira road, Vasai, Versova,Surat), Hindustan Petroleum (Mumbai) and Hindustan Unilever (Gandhidham, Pune).